People in leadership positions have a special responsibility to reach back and help those who are just starting out in their careers. That was the message Deborah MacLatchy, Wilfrid Laurier University’s president and vice-chancellor, delivered during her address at a luncheon celebrating women in leadership. “We need to pay it forward through advocacy and leadership,” said MacLatchy at the sold-out event at Hacienda Sarria in Kitchener. 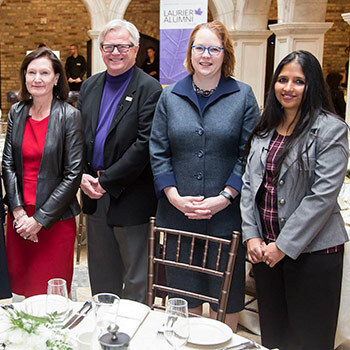 Laurier and the International Women’s Forum co-hosted the luncheon on Tuesday, March 6. Held in honour of International Women’s Day on March 8, the lunch panel discussion featured female leaders from business, technology, science and the non-profit sector. During an open question-and-answer session the leaders shared their insights on navigating career paths and how they envision the future for women in leadership. Alan Quarry, chair of Quarry Integrated Communications and a Laurier instructor, moderated the discussion. “If there is an opportunity to demonstrate your ability always stand tall and say yes, even if you’re scared,” said panellist and Laurier alumna Jessica Chalk. Chalk is president and CEO of local tech firm TrafficSoda. Panellist Shohini Ghose, a Laurier professor of physics and computer science, was the self-described ‘devil’s advocate’ of the discussion. She challenged the audience and panel to rethink the idea of leadership and how the very existence of a ‘special’ group can be exclusionary. Ghose instead advocated for policies that support more inclusivity and give space for people from all backgrounds to follow their aspirations. “If we’re going to focus on systemic change, we can’t just focus on women leaning in and stepping up, it’s also about men leaning out and stepping back,” she said. The other panellists included Katharine Bambrick, CEO of the Ontario Trillium Foundation and Ellen Moore, president of Chubb Insurance Company of Canada and Chubb Life Insurance Company of Canada and president of IWF Canada. For further information about the event, read the news release.